Do You Need a Professionally Recorded Demo? Should a Demo Be Perfect? It seems logical that something so important needs to be in perfect shape to get the job done. In reality, that's not the case. People expect your demo to be rough. It's a taste of your songs and musical style that's not intended to be a finished product. Everyone who receives your demo is well aware of how expensive recording is and that you're an artist trying to get started - they don't expect you to invest thousands of dollars in a professional recording and you're simply not going to be turned down based on its recording quality. In fact, a swanky, professional demo could actually hurt you. It may seem like spending a lot of money on a professionally recorded demo sends a message that you're serious about your music and you're confident enough to invest in yourself. In reality, when a label receives a demo with 15 studio recorded songs and a 16-page full-color booklet, the reaction is eye-rolls all around. It's a bad investment, and it says that you're naive about the music industry. 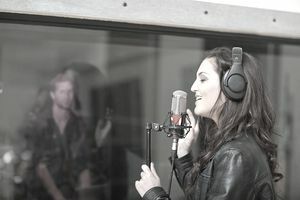 It also opens up the question as to whether or not you're ready to undertake the humbling process of trying to get a music career off the ground which involves much more than kicking back in a posh studio. You're planning on , at least on a small scale, while you're shopping it to labels. You're trying to get signed to a very small label that you know doesn't help out with and you want to show them that you can deliver a finished product. Neither of the above reasons applies to a band just getting started. Taking a gamble on paying for recording can be worth it if you are already established to some degree—you've had interest from labels, you've gotten good press, and you've toured extensively. You need to be in the position to exploit your album so you can make the expense of recording it worthwhile. Showing that you can deliver the finished goods is one thing but make sure that the label is actually interested in the finished goods first. Even with a small label, there's no need for your first interaction with them to involve presenting a professionally recorded album. You can pull off some pretty professional sounding , allowing you to straddle the rough demo/release-ready recording while staying within a budget. Music is extremely expensive, and unless you have deep pockets, stick to spending your money on getting your music career off the ground rather than a slick demo.